Knicks. How the heck could you leave RAY freakin' ALLEN that open on that play. 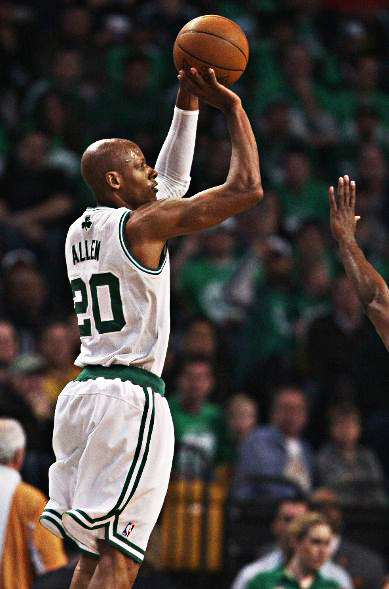 It's Ray Allen, one of the best pure shooters of his generation. Even with Garnett's illegal elbow, you still mirror that guy in that situation. I mean look at the photo. That hand running at him is amazingly late getting to him. And speaking of crap defense. Lakers. You guys do remember that you have to play, right? I mean when Jarret Jack and Aaron Gray combine for 10-11 shooting and combine for 27 points, you ain't playing no defense, guys. Their owner is borrowing money to cover salaries, and they are already 5.5 games behind the Rockies. if this does indeed turn out to be a down year for the Dodgers, how big do you think the fire sale would be? Do you think they would trade Matt Kemp rather than pay him epic bucks this offseason? Andre Either? Same question for the Twins. If this does turn out to be a down year for the Twins, do you think they begin the fire sale? How about Carl Pavano or Scott Baker to a contender? What about Denard Span and his reasonable contract which runs through 2014? I wasn't the biggest fan of ESPN's Gruden QB Grill, but it sure was telling how bad Cam Newton responded to Grunden's question about playcalling. At one point, Newton even complains that Gruden is putting him on the spot. Take a look. Jake Locker and Ryan Mallet had to diagram and break down plays...newton couldn't even give the terminology for a play they ran at Auburn. Still almost every mock draft has Cam Newton going first. All I can say is the Panthers better know exactly what they are getting, be prepared to coach him up hard and tailor the offense to what Newton does best. The Yankee Analysts had a good comment today about Brett Gardner. "I’m a big Brett Gardner supporter, but he’s off to an almost remarkably bad start. That said, he’s still not even the worst LF in the AL East right now- that would be a Mr. Carl Crawford (.137/.185/.157/Yikes). I guess Andrew Jones is the best solution if the Yankees can’t get Gardner going anytime soon." Epic agree. A platoon between these 2 guys might not be the worst idea, at least for a while. So Curtis Granderson....how's that improved swing? Interesting mock draft by the guys at Cold Hard Football Facts. They put Jerome Beal and Sam Acho in the first round and knock on Julio Jones and Blaine Gabbert. Beal and Acho don't make Rob Rang's Top 50 and to CFN.com, Beal is the number 10 OLB and Acho is the number 11 DE. To the National Football Post, Acho is the number 16 DE and Beal is the number 27. Wow. You're a potential Top 10 pick, and you're interviewing for millions of dollars and you do this? Just a hunch. The first trade of the season. Jose Reyes to the Brewers for prospects. Think Grady Sizemore knows it's his big contract year? 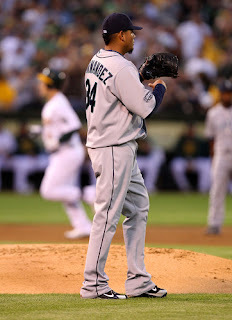 I wonder if something is wrong with King Felix. His ERA is 4.33 and his H/9 is way up to 9.7. But according to Fangraphs.com he is throwing his change almost 23% of the time. Also he is throwing his curve 16% of the time and is throwing both his 4-seamer and 2-seamer a lot less. His speed is down a little across the board, but not frightfully so. This is just speculation, but when his WHIP is way up, his Ks are down, so the question could be there. How can the National Football Post give the Steelers at pick 31 Mark Ingram. That would be the silliest pick in a decade for the Steelers, especially with the help they need first on the O-line and secondly on the D-line. And at CB. Maybe they are still under .500, but the Pirates are sure fun to watch. Have a look whenever they're on. And lastly, for those who haven't seen hit. Here's Justin Verlander's brain fart on the mound—one of the funniest balks I've ever seen.